Great that you are excited about this subject! 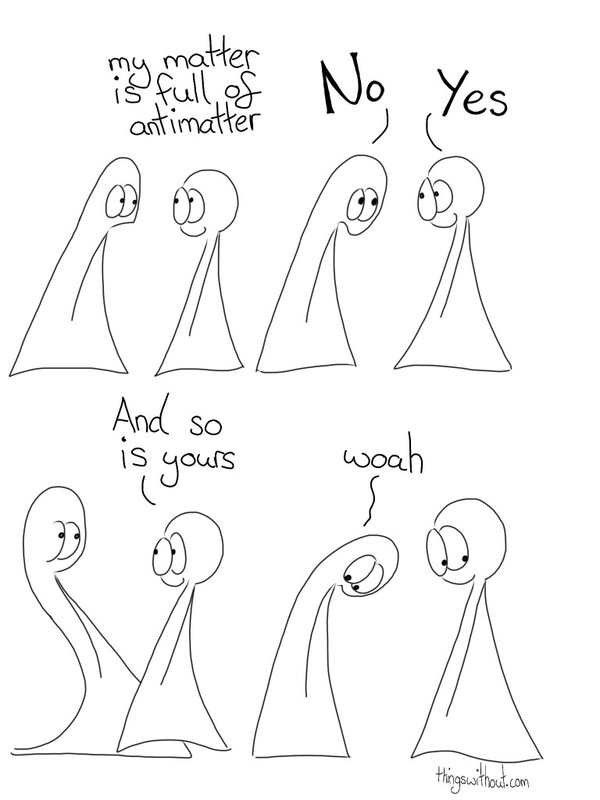 I am often tempted to start babbling to strangers on the street about the subtle beauties of particle physics, so when someone actually wants to know, it is wonderful. I used to research the area and I miss it, but the great thing is that new developments and discoveries are always being made and I can keep learning. A couple of clarifications. Particle physics is full of jargon, so it is important to get the meanings clear. Elementary matter particles are all fermions (which only means they have spin 1/2), and they consist of 6 quarks, and 6 leptons. The leptons include our friend the electron. The quarks combine in various ways to produce matter. When a quark and an anti-quark hang out together, they form what are known as mesons. Important note: the anti-quark in the pair is not the antiparticle of that particular quark, otherwise they would annihilate! A green u-quark cannot pair with an anti-green u-anti-quark, but CAN pair with a red u-antiquark! BTW ‘color’ for quarks is just a label to describe an attribute for which we don’t have an analog at our scale of things. When three quarks come together as in a proton or neutron, they form a category of particle called baryons. The matter we’re made of at the very basic level consists of u and d quarks and the electron, and as they interact, they exchange ‘force field particles’ like the photon, the gluons, and the W and Z particles. The more exotic particles like mesons are not generally found in ordinary matter because they are not stable. We see them in cosmic rays and produce them in accelerator collisions. Similarly we don’t find a lot of antimatter in our universe, which is a) good because there would be a lot of annihilation going on, and b) puzzling because there is no clear reason why the universe should prefer matter over antimatter. There are various hypotheses about this. Is matter defined as stuff of substance bigger than a particle? That was something I was puzzling over. If a particle is matter then it anti-particles would be a teeny tiny piece of antimatter bounded within a system that is, overall, matter. Is it, particles are to atoms as matter is to molecules? Also, checking in, my impression was that baryons could contain anti-quarks as well as quarks in their triad. Is that incorrect? And thanks for the link to the particle physics overview. I went over the chart of particles with fresh eyes. Most common Baryons seem to be made entirely out of anti-quarks. I imagine my brain diving for the coolest thing and from an Earth centered perspective (after all most people contain trace elements of a large chunk of the periodic table… unless that understanding is wrong too) assumed that if it existed it would be in us too, rather than bearing in mind the universe as a whole has some really weird stuff in it. Looking through the charts, I imagine the baryons containing anti-quarks are about as rare as mesons. Doh! I’ve redrawn tomorrow’s comic given it seems like there’s a bit of BAD physics in today’s comic, even if antiparticles hanging out with particles is still completely amazing. My brain is still trying to come to terms with when does a photon become its antiphoton (or is it always in a wave/particle kind of way). Do we bombard them to reverse their spin, is it how we look at them? But that’s probably a conversation for another day! Oh universe, the more I look at you, the more intrigued I get. The more I think, what do these words actually mean?